By the winter of 1942, the Red Army of Workers and Peasants had contained the German attacks of the previous summer and fall. Now came the time for a whole series of counter-offensive of its own, designed to cut off and destroy the weakened Nazi armies. The northernmost of these would be Operation Mars, aimed at the German Ninth Army around the city of Rzhev. The Soviet plan, the work of the brilliant Marshal Georgi Zhukov, called for smashing the already-weakened Germans with a heavy commitment of tanks and fresh troops. When this first objective had been reached, a second operation, code-named Jupiter, would encircle and destroy the German 3rd Panzer Army to the south. Despite horrible weather and very rough forested terrain, the initial Soviet attacks went very well. But German resistance stiffened, and as the Red Army failed to make further progress Zhukov reacted by committing more and more men and tanks. Suicidal courage only added to the Soviet casualty lists, and by the time the offensive sputtered to a halt Soviet losses topped 335,000 men and 1,600 tanks. 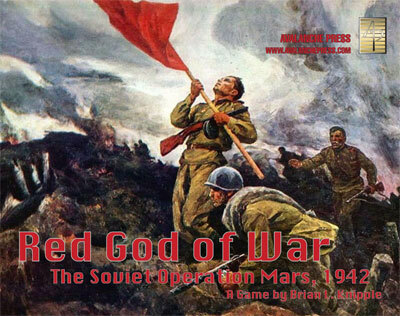 Red God of War covers Operation Mars using the same game system as Alsace 1945. Game pieces represent regiments, brigades and divisions. Headquarters are vital to activate units and send them into action; supply is also important to keeping your units at full efficiency and players must choose how to allocate their resources. There will never be enough of them to accomplish everything at once. Status; This game is no longer available.